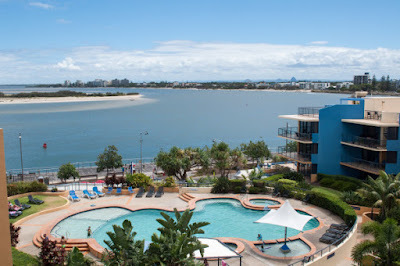 We have been in Caloundra for almost two months now and while the novelty is wearing off our enjoyment of the place continues - despite the wettest summer in years. It has been a baptism of water, literally. We are loving our apartment and making adjustments to manage the lack of space, the wonderful view more than making up for any inconveniences. Its central location is a bonus, we can walk to the beach, shops, bank, post office and most amenities. Being in the heart of the town and close to the beaches also puts us in the heart of the 'tourist' areas. We are surrounded by people on holiday, relaxed, happy and enjoying life. It creates a great vibe to live amidst. How little did we realise that we would actually be living in a place where we could easily holiday. This is still so amazing to us. Places and faces are becoming familiar. Routines and rhythms - school, work and Colin's travel - are giving structure to days and weeks. Missing the kids is being balanced with the joys and excitement of new lives and possibilities. It feels a bit like an in between time at the moment, we have left our Melbourne lives and sometimes feel sad at what has been left behind and at the same time are yet to create a life up here where we feel we belong. But progress provides hope. Johanna has settled in remarkably well at her new school, making friends and enjoying her classes. I have joined a tennis group and am about to begin some volunteering. Colin has his sights set on a local longboard club (for old blokes I think) There is sadness and joy, challenges and opportunities, letting go and reaching out - we are weathering the storms of change in our lives and mostly it is good. We took a risk and are experiencing the consequences, both those we like and those we don't. Who knows how it will all unfold, that is the attraction and the risk of adventure.